Hotel Cecil is one of the nicest new initiatives in the Copenhagen entertainment scene. Housed in the old interiors of Jazzhouse, the venue is elegant and classy, has great acoustics, and even a craft beer selection on tap, which makes it a perfect fit for events of all sorts ranging from stand-up comedy to concerts. 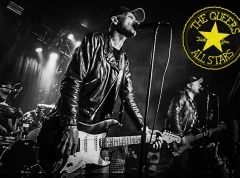 Tonight, we are here for Swedish skate punk legends No Fun At All and their first live performance in Denmark in over eighteen years. And the Danish punk scene has shown up strong in big numbers: around 180 or so people have paid entrance based on a rough estimate, which isn't that surprising considering the band has records like "Out Of Bounds" and "The Big Knockover" in their back catalogue, both quintessential skate punk classics from the 90s. Great to see so many people, now where's everyone for the smaller shows? Local punk rockers Wayl have a great opportunity here to earn some new fans by opening up for the Swedish skate punk legends. They're known for opening for all kinds of punk bands touring Denmark, but tonight is probably their best fit so far given their NOFX and Pennywise hybrid form of skate punk. It's also one of the biggest stages they've played on, yet it works to their advantage especially on the back of the excellent songs off 2016's "In Bed". The band looks and feels tighter than ever, and I feel like I keep repeating this in my reviews of them, but the band really are getting better and better each time you see them. Tonight, "Dear Union" is an early highlight that gets the crowd going, a mosh pit forms for another, and "Stand Your Ground" is once again the Copenhagen scene anthem that based on its reception in the crowd should earn a much bigger sing along next time around when crowd has learned the lyrics. As usual, the band engages in light-hearted chatter throughout, making jokes about how drummer Sonni's kit is bigger than the No Fun At All drummers, et cetera. The end result is a fun, tight underground punk rock set that certainly feels like a mature, ready for touring package at this point. There are a select few bands that come to mind as the quintessential skate punk bands from the 90s and early 2000s. No Use For A Name, Millencolin, Pennywise, Lagwagon are some of the household names, but No Fun At All absolutely belongs in that company as well. With frightening consistency, the Swedish melodicore pioneers have released six albums throughout their career that do everything right when it comes to skate punk. Ultra-tight, wide-open riffs, catchy choruses, and pedal to the floor without the need to necessarily evolve as a band in any particular direction from the core of skate punk. That spirit and the sheer quality of song are very much in the atmosphere tonight as the band tears through a good 25 cuts evenly divided between their entire back catalogue, all the while portraying formidable energy on stage at all times. Straight off the bat, the band starts contrasting old with new to a great success. "Believers" from 1994's debut album "No Straight Angles" is immediately followed up by "No Fun Intended" from this year's "Grit": both receive a cheering reception from the crowd that quickly forms a circle pit that continues energetically throughout the whole show. The spotlight is quickly stolen by the "Low Rider" classic "Mine My Mind", although the first huge sing-along arrives with "Wow And I Say Wow" a few songs later. On stage, vocalist Ingemar Jansson draws parallels to Greg Graffin. He's mostly gesturing and standing still, occasionally wandering around on stage, grabbing hold of his mic, but it creates a nice contrast against the guitarists and the bassist who circle round, showcase scissor jumps, and generally move around in a way that suggests they're having an absolute blast on stage. The band is helped by what is a near-perfect mix sound wise, leaving their melodies crystal clear and the lyrics easy to follow. The crowd dynamic is intense: everyone's either moving in the crowd, raising fists and hands and reciting lines from the songs, or bobbing their head at every chance given. So when the band breaks out "Perfection" for a brief a capella segment, the response the crowd is chilling, to say the least. Everyone's singing along in a moment of punk rock communion that matches the song title. "You really gotta help me sing this one, Copenhagen", Jansson jokes around before the band tears into "Out Of Bounds" late in the set. We happily oblige, as we have been doing for the majority of the set that's every bit as consistent as their studio albums. No lulls, no boring parts, just straight up skate punk classics delivered track after track, blending together new and old in a seamless fashion. "Stage left is stage dive service", Jansson lets us know, where an eager bunch of fans is waiting to catch any would-be surfers with their hands ready in the air. It's a moment that captures the show's essence perfectly: it has the look and feel of a tight, intimate basement show but just in a much larger setting. So when the band play "Catch Me Running Around" and gesture for a circle pit, it engulfs the majority of the floor area as people of all ages are jumping in for a song that's as classic of a circle pit song as they come. "Beat 'Em Down" and "Master Celebrator" close out the set to anthemic sing-alongs from just about everyone at the venue, leaving behind a brilliant vibe and a feeling that, yes, No Fun At All is still one of the very best skate punk bands in existence.